Welcome to Cyclingnews' live coverage of the elite men's ITT at the 2016 UCI Road World Championships. Hello there, and a warm welcome to our live coverage of the elite men's individual time trial at the 2016 Worlds. Indeed, it's very warm out there in Doha, with the heat becoming a contentious issue since the championships kicked off at the weekend. Whoever claims the rainbow bands today will have to be able to deal with the heat and it's set to be a fierce competition, with some big names and some hopeful outsiders on the start list. Rwanda's Bonaventure Uwizeyimana has the honour of being the first rider today and he rolls down the start ramp to kick off this day of racing. Riders will set off at intervals of 1 minute 30 seconds. There are 69 riders on the start line and last year's champion Vasil Kiryienka (Belarus) will be the last rider down the ramp, at 15:12pm local time. Sayed Ahmed Alawi (Bahrain), Mohsin Khan (Pakistan), Arvind Panwar (India), Salman Hasan Alsaffar (Kuweit), and Redi Halilaj (Albania) are all out on the course now, but the big names are all gathered further down towards the end of the start list. It's 40km long, pan-flat, with several tight turns. Unlike the previous TT's at these Worlds, this one doesn't take place exclusively on the 'Pearl' artificial island. Instead it starts out at the Lusail Sports Complex with a series of slightly strange twists and turns. The riders will be able to get their biggest gears ticking over on the subsequent straight section that will take them to the Pearl, where they'll cover a truncated version of the sinuous course we've seen in the other TT's so far. Gediminas Bagdonas (Lithuania) gets his ride underway, and he could provide us with an early reference point in terms of timings. Who's going to win today? The bookies seem to have Tony Martin and Rohan Dennis neck-and-neck at the top of their odds sheets. This is a power rider's course and a Tony Martin at the height of his powers would take some beating. The German, however, as been under par against the clock this season and has had some troubles with his position on the bike. Having reverted back to his old trusted position, he won the Tour of Britain TT last month and was part of the Worlds TTT-winning Etixx-QuickStep squad last weekend, so he should be seen as a bona fide favourite today. He has won the World TT title three times, and has the chance to tie Fabian Cancellara on four. Soren Kragh Andersen (Denmark), Reto Hollenstein (Switzerland), Alexey Vermeulen (United States Of America), Vegard Stake Laengen (Norway) set off as we get some WorldTour riders on the course. And now we have our first outsider for the title. It's Poland's Marcin Bialoblocki, who rides for ONE Pro Cycling and won the Tour of Poland's final-stage TT last year. He signalled his intentions for these Worlds by breaking both the 10-mile and 25-mile UK time trial records, both held by Alex Dowsett, last month. Jasha Sutterlin (Germany) rolls down the ramp now. He was third in the Eneco Tour time trial - the last top-level pre-Worlds test - and is a young rider who could spring a surprise and grab a high placing today. Irish neo-pro Ryan Mullen, a former national TT champion, is looking strong and is setting the pace at the first intermediate checkpoint with a time of 16:13 - a good 30 seconds up on the next quickest, Andriy Grivko (Ukraine). It's another scorcher out there, with temperatures of around 37 Celsius today. There's a slight breeze but the wind shouldn't be a huge factor today. The heat in Qatar has been a contentious issue ever since these Worlds kicked off. Even before they kicked off, in fact, as they had to be pushed back to October in an attempt to mitigate the conditions. Anouska Koster seemingly passed out on the bike and crashed during the women's TTT as a result of heatstroke on the opening day of competition, and yesterday Ashleigh Moolman-Pasio lay on the ground needing attention to cool her core temperature after the women's time trial. There have been a number of similar incidents in between, too. Here's Barry Ryan's story on the issue, with a lovely pun in the headline. Jos Van Emden of the Netherlands goes just outside Mullen's time at the first checkpoint, and the Irishman is continuing his strong ride, knocking nearly a minute out of Grivko at the second checkpoint. The first fans are already in @ThePearlQatar to welcome the riders! The organisers, there, trying to pretend there are actually some crowds here - another of the issues with these Worlds. Bonaventure Uwizeyimana comes across the line in a time of 55:05 but his time is already being bettered by several riders. Bagdonas knocks chunks out of the best times with 48:30, but Andriy Grivko is soon across the finish line to better that by 13 seconds. And here comes Ryan Mullen. And it's a storming time! 46:04 for the Irishman, who takes a full 1:13 out of Grivko. We wondered whether he might fade in the final part of the course, as many have done this week, but obviously not. The riders are coming down the start ramp thick and fast. The latest batch has some strength within it - Yves Lampaert (Belgium), Stephen Cummings (Great Britain), Ramunas Navardauskas (Lithuania), Jack Bauer (New Zealand), Luke Durbridge (Australia). Mullen's in the hotseat but it's going to be close between him and Van Emden, who went a shade quicker at the second checkpoint and is now approaching the Pearl. Primoz Roglic gets underway now. The Slovenian has caught the eye against the clock this year, in his neo-pro season, and took a sensational victory in the long time trial at this year's Giro d'Italia. Bialoblocki comes in now and posts the second fastest time, but he's still 53 seconds slower than Mullen. Third fastest time for Bialoblocki, sorry. Second fastest so far is the Swiss Reto Hollenstein, who was half a minute off Mullen. Here comes Van Emden, and he has faded and will not challenge Mullen's time. He stops the clock on 46:28 - that's 24 seconds off the pace. He goes into second but couldn't match Mullen in the final kilometres on the Pearl. Luke Durbridge, aka Turbo Durbo, is 20 seconds down at the first checkpoint, and he grabs his bidon and douses his legs with water. Alex Dowsett, the four-time British champion, is underway. Here he is before the start with a cool vest and ice around his neck - a common sight at these Worlds. Stefan Keung and Manuel Quinziato, two members of the BMC team that won the TTT title at the previous two Worlds and came second this year, are out on the course. More strong riders off the ramp now in Taylor Phinney (USA), Edvald Boasson Hagen (Norway), who can turn in a strong TT. Belgian champion Victor Campenaerts takes us into the final 10 riders. None of the riders who've been coming across the finish line recently have been able to challenge Mullen's time or indeed the top five. You can see the provisional standings over to the right of your screen. Jonathan Castroviejo sets off now and he is certainly a threat today. The Spaniard has been on the cusp of a major time trial win for some time and stated his credentials by becoming European champion recently. Here comes Tony Martin! Can the German replicate his Worlds form of old? Rohan Dennis (Australia), the other big favourite for today, rolls down the ramp. Coming from Australia, he should be well equipped to deal with the heat. Tom Dumoulin (Netherlands) is next. Is this course too flat for him? And here comes last year's champion, Vasil Kiryienka (Belarus). His time trial form this season has been concerning to say the least, and he's not one of the big favourites, but certainly can't be dismissed. That's everyone out on the course. Here we go then. We're around 45 minutes away from knowing who'll be the next world champ. Yves Lampaert has moved into second provisionally with a time of 46:28.10. That's still 24 seconds off Mullen, who remains in the hotseat. Steve Cummings finishes 1:26 off the pace, while his compatriot Alex Dowsett can only manage 12th at the first split. Sixth place for Luke Durbridge, with 47:11.33. Tony Martin approaches the first checkpoint and now Mullen is being put under pressure. The German is 7 seconds up. The big favourites are all through the first checkpoint. Dennis is 10 seconds down, and Dumoulin 21 seconds down. Kiryienka looks good, though, going second fastest, three seconds down on Martin. Nico Roche shakes his head as he crosses the line, almost 2 minutes down on his compatriot Mullen, who he beat to the Irish title this year. Taylor Phinney is looking good out there. He's fourth quickest so far at the second checkpoint. But Castroviejo comes through now and he's just a couple of seconds down on Mullen at the moment. Tony Martin, however, is up on Mullen. And how. The German is 36 seconds up at the second checkpoint. Wow. Martin Toft Madsen (Denmark) crosses the finish line and slots in fifth place provisionally. And now Dowsett takes that fifth place by going a shade quicker. Dumoulin looks good on the bike, as always, but he's 9th at the second checkpoint, almost a minute down on Martin. He won't be our world champion, it seems, and it doesn't look like he will even make the podium. Rohan Dennis is 35 seconds down on Martin at the second split. Kiryienka posts 29:49 at the second split. That's the second fastest time at that point - 21 seconds slower than Martin. 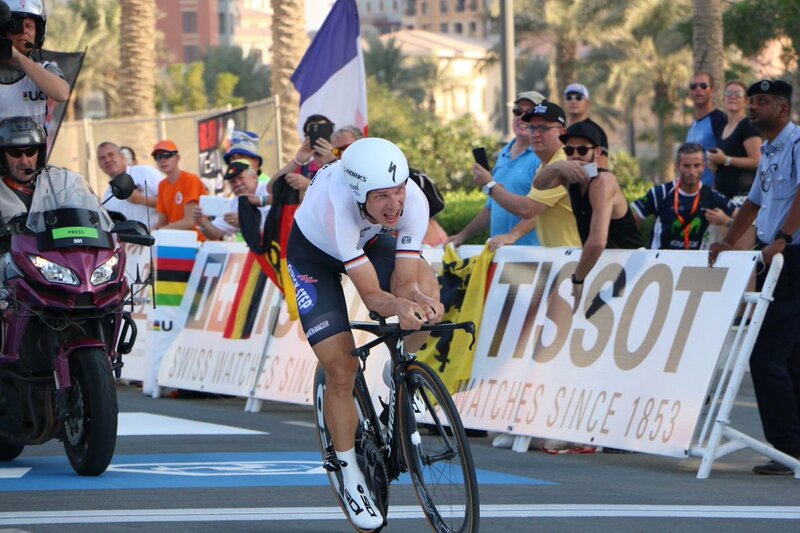 Tony Martin, it would seem, is heading for a record-equalling fourth Worlds TT title. Taylor Phinney comes home but he can only put himself into eighth provisionally. Victor Campenaerts is unable to make any impact on the upper reaches of the leaderboard. Bob Jungels comes into the finish. It's a strong ride and he takes fifth provisionally. Tony Martin is showing no sign of letting up here. Kiryienka is producing a really strong ride and could be good for the podium. 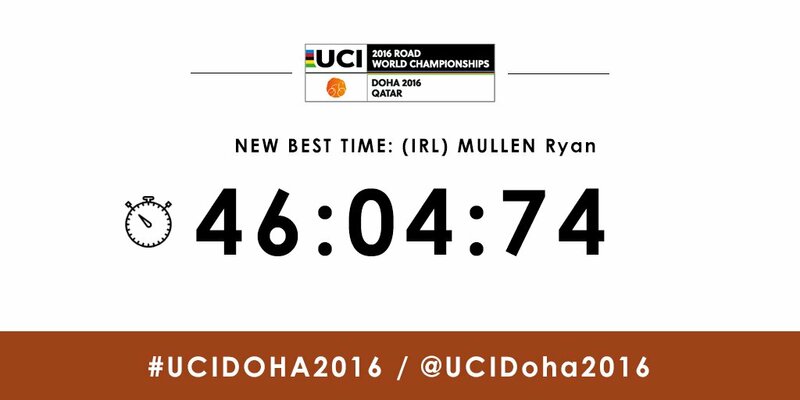 Speaking of the podium, Ryan Mullen has a really good chance here of hanging on - what a result that would be. Castroviejo is coming into the final part of his ride and he's going to post a strong time. Maciej Bodnar produces a storming end to his ride to beat Mullen's time by 5 seconds. Wow. Castroviejo, the European champion, knocks a further six seconds off the best time. Martin is hot on Castroviejo's heels and nearly catches him by the line. The German sets 44:42.99 to beat the Spaniard's time by a whopping 1:10. There's our world champion, surely. Dennis and Kiryienka still out on the course. What can they do? Dennis is already well outside Martin's time. He's a minute down entering the final couple of hundred metres. Can he get himself on the podium? Fifth place provisionally for Dennis, who can't beat Mullen. Here comes Dumoulin, who will be outside the top 5. Kiryienka, meanwhile, is not going to beat Martin's time. Here comes Kiryienka. He takes the silver medal! The news filters through to Tony Martin and the German leaps to his feat to celebrate and is swamped by his entourage and the media. What a ride from Tony Martin! He wins with a margin of 45 seconds to take his fourth Worlds TT title after his 2011-2012-2013 treble. He now holds the joint record for most ever wins with Fabian Cancellara. Castroviejo is knocked down into third but that's still a great result for the Spaniard, who played down his expectations coming into the race. “It’s amazing. I can’t believe it," says Tony Martin. "Everyone knows I hadn’t had a good year so far, until Sunday [TTT world title], so becoming world champion is incredible - it makes everything that happened this year forgotten." 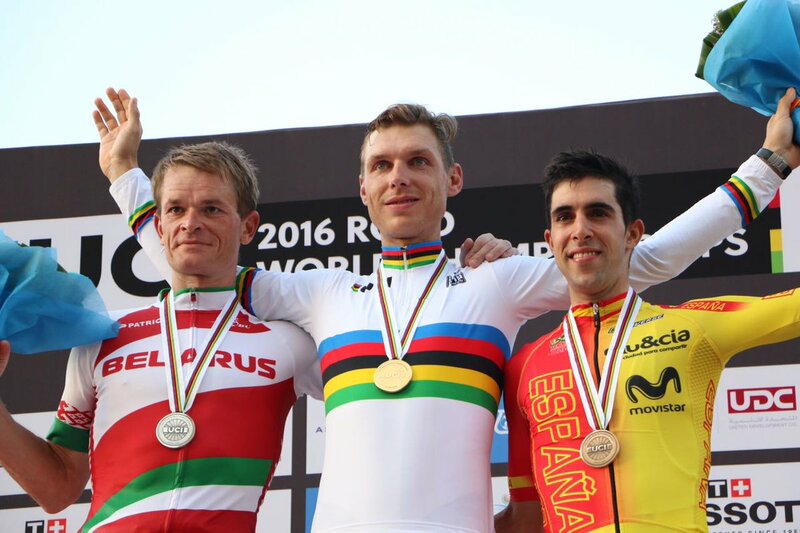 Martin is up on the podium and pulls on the rainbow jersey with the gold medal around his neck. "The course was really made for me. The only thing I was scared of was the heat but I had good preparation at home, then coming here having a good week with the team, getting a lot of knowledge about what I had to do. I was also strong in the head, I was not the favourite, I had no pressure, I just had fun on the road, I have to say." Martin was asked about equalling Cancellara's record of four world TT titles. "I always said I don’t count the victories. I look forward from year to year, and I want to be world champion every year. I’m so proud I am able to wear the world champion’s suit next year – I’ve missed it a lot." That's the time trials out of the way. Up next are the road races. Here are 5 key riders to watch in the Elite Women's race on Saturday. That old familiar position was key to Martin's success. "This gives me a lot of confidence for the future," says bronze medallist Castroviejo to Spanish media, adding that it shows he can compete "on all sorts of courses - whether they're tough or favourable." We have video highlights from the time trial so you can re-live the action. Tom Dumoulin says he noted a dramatic drop in his power output today, also saying he struggled with the heat. The Dutchman could only manage 11th today. That's it for our live coverage today. Thanks for your company, and make sure to join us again this weekend for the road races. I'll leave you with our full report of a historic title for Tony Martin.